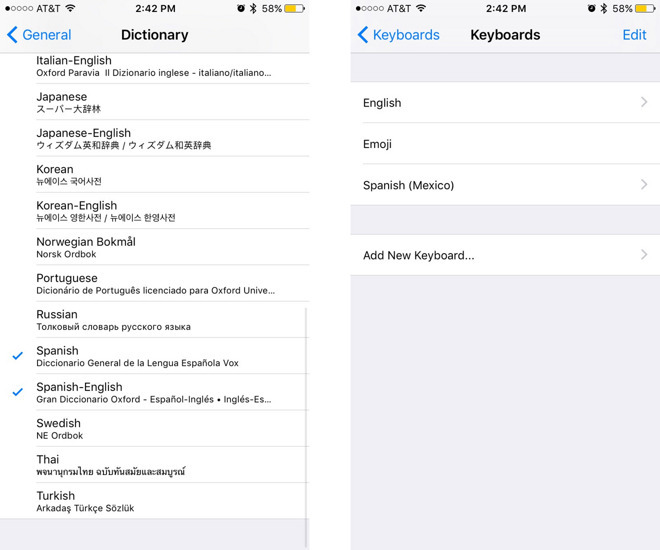 To make the option work, users should make sure desired languages are enabled in iOS 10's new Dictionary menu under Settings, then add the correct keyboards under General > Keyboards. Once this is done, Apple's QuickType should both accept multiple languages and offer appropriate word suggestions. In iOS 9, the only way to switch between languages on the fly is manually selecting them in the same way you'd switch to emoji. Aside from being inconvenient, it also ignores the fact that even monolingual typists will sometimes use expressions from other languages. QuickType's other main upgrade in iOS 10 is "Siri intelligence," used to make contextual suggestions that go beyond single words. Someone asking "Where are you?" in Messages, for example, will prompt iOS to offer up your current location. iOS 10 is already out as a developer beta, which will be followed by a cleaner public beta in July. The software's final release date is sometime this fall, most likely in September in advance of new iPhones.